It wasn’t that long ago that most conference attendees experienced a live event one way—live. But now, thanks to the ubiquity of personal devices and a growing population of attendees known for their voracious appetites for digital content, smart marketers are designing live event experiences with content capture, creation and distribution for the small screen top of mind. The result: a completely new model for b-to-b events that delivers one-of-a-kind experiences to live and virtual audiences when, where and how they want them. Besides being more cinematic, these next-generation content strategies can produce exponential returns on some of your biggest investments. 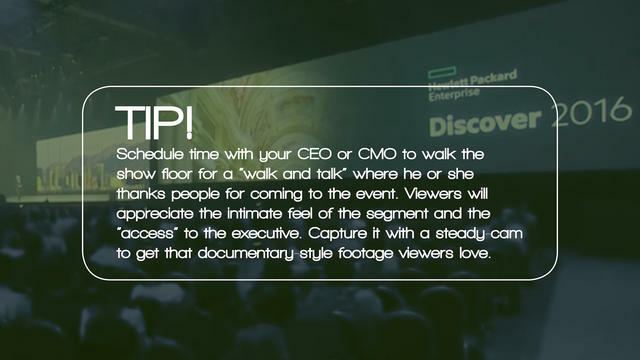 From live streamed keynotes peppered with exclusive content just for virtual attendees, to broadcast studios delivering up-to-the-minute interviews, news and demos live from the show floor, every moment of any conference can now be filmed, edited and leveraged across social and digital media to extend the value of your live events—all while boosting awareness with new and increasingly more global audiences. And it’s not just about boosting awareness. 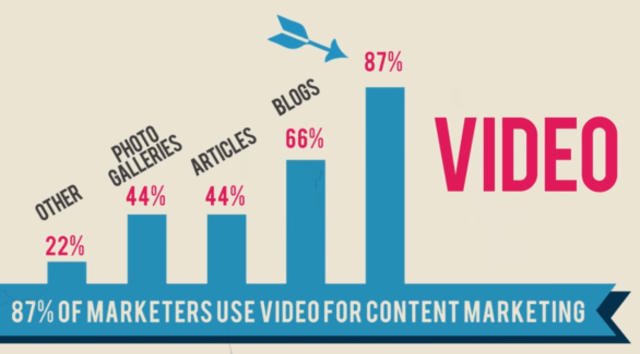 According to a 2015 Demand Metric Video Content Marketing Benchmark Report, 74 percent of b-to-b marketers said that video content converts better than any other medium. Cisco predicts that 80 percent of all Internet traffic will be streaming video content by 2019, up from 64 percent in 2014. In the Content Marketing Institute’s 2016 B2B Content Marketing Report, videos ranked #5 in a list of the 10 most effective marketing tactics (in-person events ranked #1). And more than half of b-to-b marketers (51 percent) list YouTube is an effective social media platform. 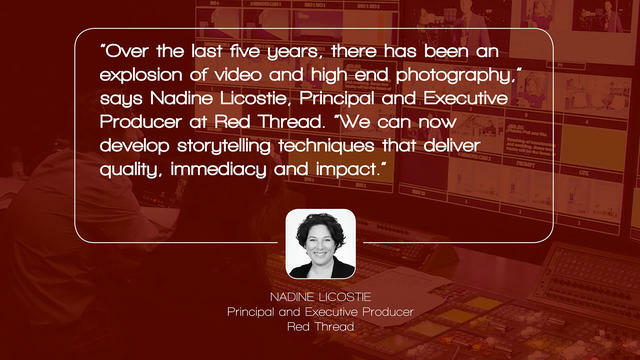 In this interactive tutorial, the award-winning content strategists, broadcast producers and filmmakers at Red Thread will show you how to create, capture and distribute compelling b-to-b video content in fresh and efficient ways. 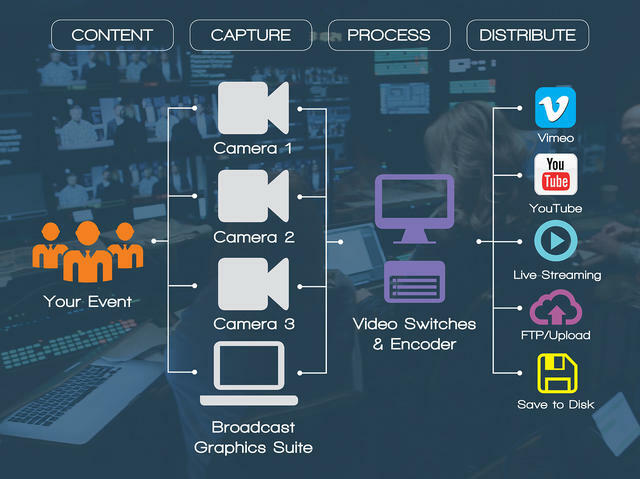 From killer post-event recaps to innovative formats for live-streamed broadcasts, they’ll give you the tools you need to map out a content strategy that can boost viewership and compete for your attendees’ mindshare. Great b-to-b conferences bring their industry’s brightest minds and biggest newsmakers together in one place. But if you don’t have a content strategy designed to capture and share these once-in-a lifetime moments, you might be leaving your company’s most valuable assets literally lying on the cutting room floor. It might be small, but that smartphone in your pocket has had a mighty impact on the world of b-to-b events. Today, event marketers not only have to think about their attendee’s physical journey through the show, they have to think about how that journey can be captured, viewed and shared across multiple digital devices and platforms. To help you kick-start a well-crafted content plan, the experts at Red Thread offer a page from their playbook: the Seven Habits of Highly-Effective Content Strategies. 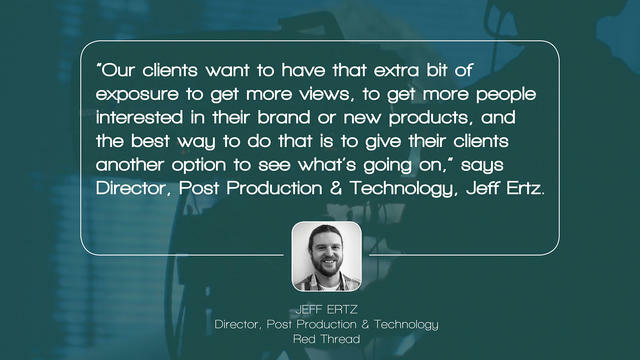 With more than 20 years in the industry and a portfolio of high-profile clients including History, Hewlett-Packard, Hewlett-Packard Enterprise, SAP, CBS and more, Red Thread’s Clio and Effie award-winning filmmakers, directors and video producers know how to create compelling content designed just for the next-generation needs of today’s digital consumer. Anybody can shoot a beautiful video, but a strong content strategy begins first and foremost with a clear vision for your event’s objectives. 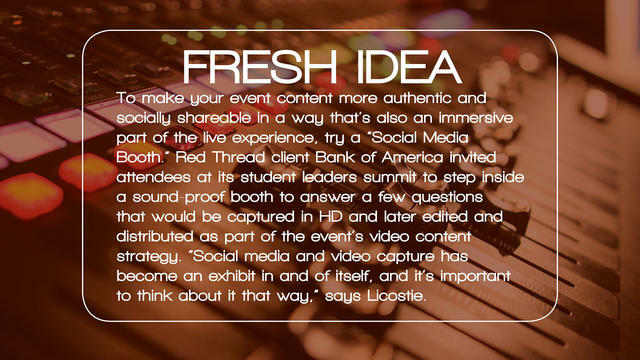 “Your content strategy has to also align with your broader strategy for the event,” says Licostie. “It should be complimentary to your goals and objectives but also should have its own goals and objectives.” If your brand wants to be known for innovation, content that captures new product releases and demos of new technologies might be a winning strategy. If your event’s signature offering is its lineup of industry gurus and luminaries, lively interviews and exclusive access to presentations should take priority. It might sound like marketing 101, but when it comes to digital distribution, knowing who is consuming your content—and how they’re consuming it (at home, during the show, on what kind of device)—is just as important as the details you use to qualify your attendees. Smart content marketers know that they’re competing with everything, from the latest viral video to the most beautiful Instagram feeds. “There’s so much content available to people at any given time you really have to know you’re competing with every kind of content,” says Licostie. Translation: be prepared to bring your A-game when it comes to storytelling and cinematography. Even a two-minute video can make an emotional impact. In the early days of YouTube, many brands embraced the look and feel of amateur video, even using their interns and least experienced staffers to create and distribute their video content. Today, the pendulum has swung the other way as consumer expectations around the quality of video content they enjoy has reached sky-high proportions. Make sure your video content is held to the same brand guidelines and standards as the rest of your marketing efforts. And don’t get shut down because of a silly mistake, like a snippet of unlicensed music in one of your videos. “When you bring in the professionals who are trained, they know what to look out for and what to let out there,” says Licostie. Many event marketers make the mistake of thinking, “If they build it, they will come,” then find themselves disappointed when they don’t get a lot of views of their digital content. “Promotional strategy is just as important as anything else when you’re doing this kind of work,” Licostie says. “Just like you promote a live event, you also have to promote your digital content.” With a strong promotional plan, “you’ll gain so much more, including new audiences for the live event,” she says. Live streaming technologies first stepped into the limelight in 2009 when the economic crash forced businesses to put a hold on their events and their team’s travel budgets. 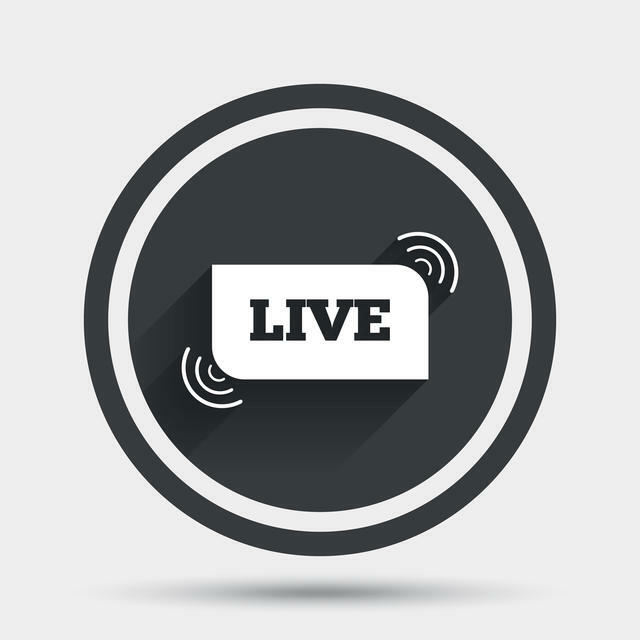 Flash forward to today and live streamed experiences that run simultaneously alongside live events have come into their own as powerful platforms for exposure capable of connecting with vast new audiences and generating exponential returns. Here, Ertz explains how you can make the most of a live streaming strategy, and what technology you need to master (don’t worry—its not much) in order to integrate it into your event plan. Finally, always key to a killer live-stream strategy is having a dedicated person on the event team that is aware of all the shooting wants and needs of the show’s various groups, and can set deadlines, budgets and requirements at least a month or two out from the event. 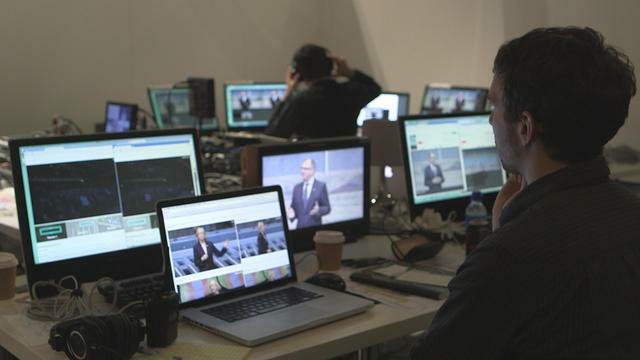 This is critical planning that enables the video production and live-streaming teams to make sure they have the appropriate number of crews in place. Of course, in events, nothing ever goes 100-percent as planned, but “the key is to set up the infrastructure for that inevitability,” says Ertz. If you don’t know the difference between a Thunderbolt Cable and a Pegasus Box, don’t worry. 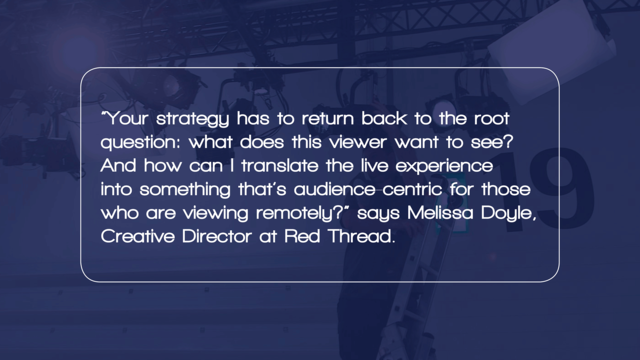 A savvy and experienced video production partner like Red Thread does, and can give you the high-level overview of why they matter to your event. What you should know, however, is that when it comes to building the technical infrastructure for a live-streamed event, redundancy is critical. Also, note that your “streamers” (the live-stream team that’s encoding your content and putting it up on the streaming site) and your video capture and editing crews are not the same people, so you need to have a good traffic manager who can help keep a steady flow of finished content going from the editors to the streamers. If you mapped out a solid content strategy before the event, there will be an ample supply of content pieces being shot, edited and finished for placement in the live-stream. “Make sure you have someone who is aware of your full content schedule to help your streamers plan out their schedule and populate their downtime, feeding them with content that is not only relevant but events that happened that day and content you want to be repeated,” suggests Ertz. 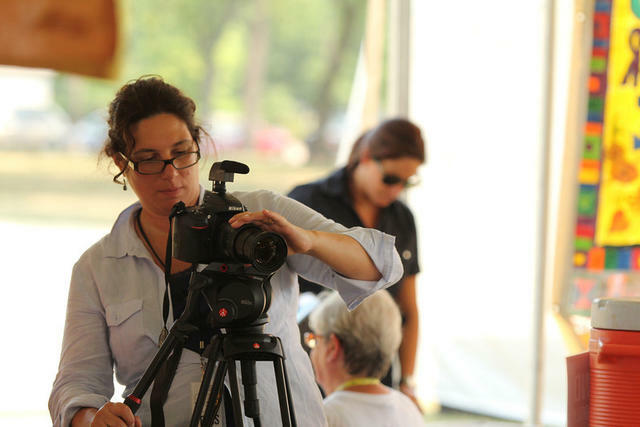 Think about how the technical nuances of your filming strategy will translate on the small screen, and how it can create a sense of intimacy for audiences not tapped into the energy of the room. For instance, use crane shots to show how big the event is and how many people are there, but don’t linger so long it makes viewers feel disconnected. Advise speakers to keep their slide graphics bold and simple so mobile viewers can read them. And use roving cameras to get different angles to keep it interesting, especially if it’s a long presentation. And finally, to make your event as easy to access and user-friendly as possible, use a platform like YouTube for all your content. It encodes the content nicely without degrading the quality, you can create and run multiple channels simultaneously and you can password-protect access. Tagging your content on YouTube with keywords also helps bring your content up to the top in Google searches, which can earn new audiences. And for the typical viewer, YouTube is familiar. “If you’re not asking them to learn something new or go on to a site they’ve never heard of before, they’re more likely to do it,” says Ertz. Plus, YouTube has over a billion users. That’s almost one-third of all people on the Internet. YouTube on mobile reaches more 18-34 and 18-49 year-olds than any cable network in the U.S.
Now that you’re thinking like a TV producer, you’re ready to unleash one of the most effective content platforms in the conference toolbox on your next event. 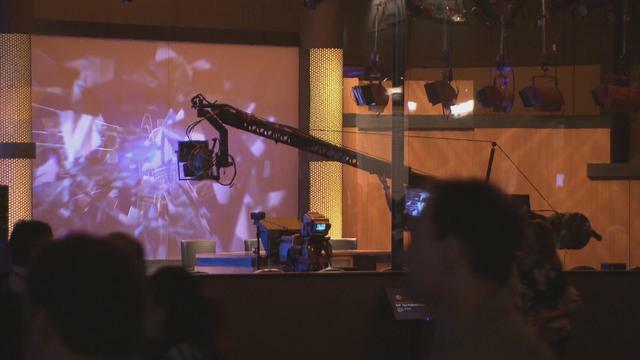 It’s called a Broadcast Studio, and just like the name implies, it’s a fully-functional studio set where, much like a live TV news broadcast, show hosts share the news of the day, run pre-recorded and live video segments and conduct in-studio interviews. 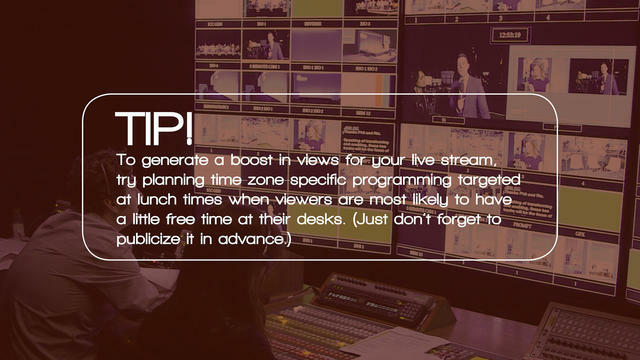 The content can be live-streamed and recorded for distribution. 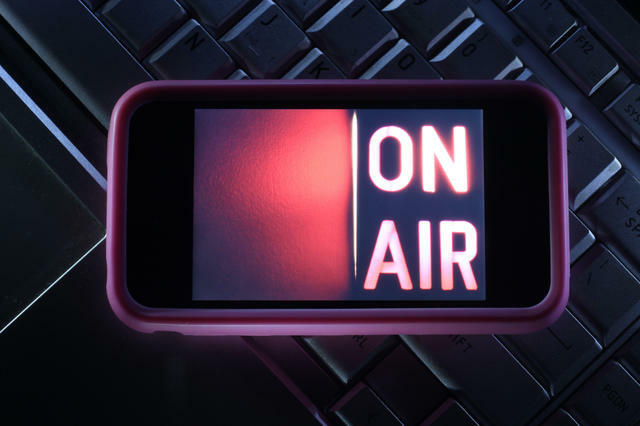 Event marketers are embracing the Broadcast Studio for a number of reasons. First, it helps distill and repackage a massive amount of show content into digestible bites that audiences tuning in can absorb easily in a format (TV) that they’re accustomed to. A thoughtfully designed studio set creates an air of professionalism around your show’s content and speakers, creating the backdrop for a high-quality end product on par with shows you might see on TV (and a welcome reprieve from the shaky videos shot on smartphones). 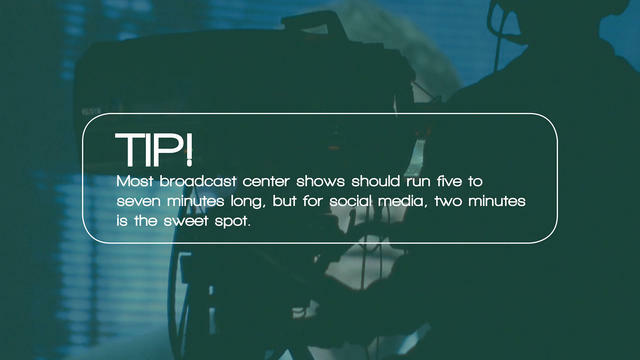 The best Broadcast Studios typically bring on-air talent or analysts on board to be a “reporter” and host for the event, which adds an element of objectivity and authenticity to the live-stream and video content. 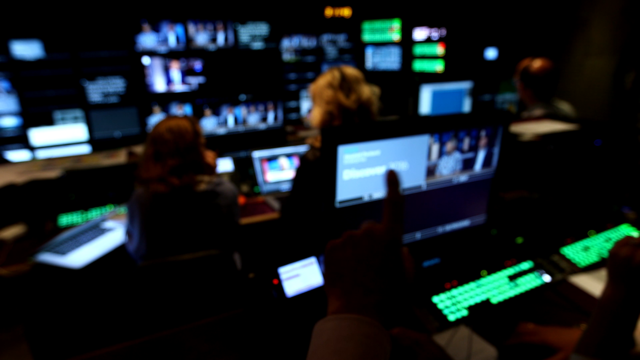 A broadcast studio requires all of the trappings of a fully-functioning TV set, from a slick studio environment to a director, producer, camera crew (often with multiple cameras) and hair and makeup. But that’s not to say it has to be a massive effort. Some companies have done a pared down version, a small studio with one or two cameras and a reporter, creating 30- to 90-second segments that have still been able to elicit the same effect. “Regardless of the size, it’s a beacon to draw them in,” says Doyle. in the middle of the show floor that creates that fishbowl effect viewers love so much. Or, if it’s a good fit for your brand and content, you can go with a late night talk show strategy complete with an opening monologue, a host, a couch and even some short comedy bits. Once the set is established, the types of content you can create are virtually limitless. Executive sit-down interviews, product demos, remotes that throw to hosts backstage before a keynote or live from the show floor, man on the street-style interviews with attendees and real news-style recaps of the day’s trends and what attendees are buzzing about are just a few of the options. 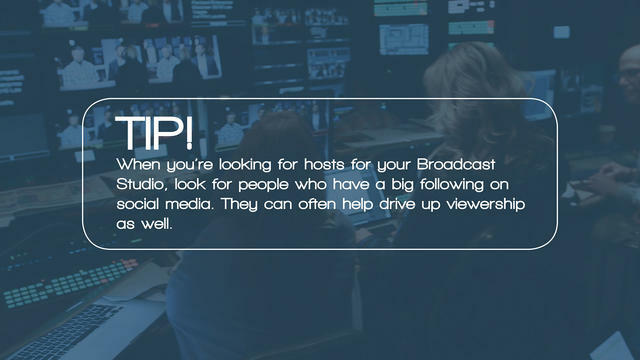 Whatever direction you take, make sure you offer a wide variety of programming that’s a mix of formats and lengths and that you leverage your on-air hosts to help you orchestrate your event’s story in a way that’s visual, emotional and entertaining. A fully-optimized content strategy that leverages all of its video assets before and after an event can add exponential value to the event’s bottom line. In the months leading up to the event, content can be used to generate awareness, cultivate new audiences and drive registrations. After the event, it can extend the value of the experience for those who attended the show in person and online, inspiring them to attend again and share their experiences with their social and professional networks. 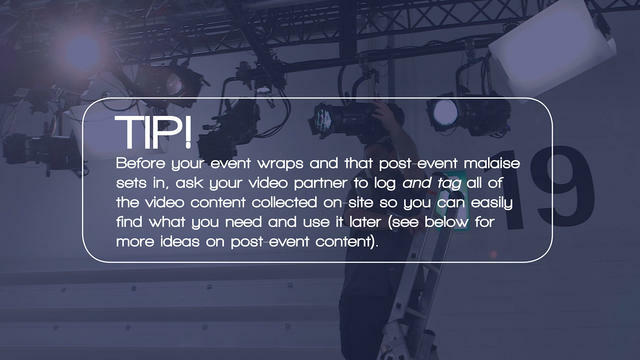 Put together, a savvy pre-, during- and post-event content strategy creates powerful and relevant touch points that keep attendees—and prospective attendees—excited and engaged between one year’s event and the next. Here are five types of pre-event and post-event content guaranteed to keep the fires burning between experiences. What it is: A compilation of the best footage and sound bites from the show, preferably highlighting the show’s biggest moments, and set to a sizzling soundtrack. How to use it: For key registration drives, use the reel to show prospects and attendees what they’ll be missing if they don’t attend. FOMO is real! What it is: Short interviews from the previous show’s broadcast studio with your company or industry’s biggest luminaries, edited and repackaged into quick cuts with music and a snappy intro. How to use it: To show off the high caliber of speakers and industry movers and shakers that are at your show. What it is: An authentic, peer-to-peer-style video just for your partner community that captures your partners and exhibitors sharing the value of being at the event. How to use it: To generate paid partnerships, exhibitor revenue and attendance by your partner community. What it is: Similar to the partner testimonials, this content captures all of the fun and engagement attendees had at the show in an authentic, non-salesy way. How to use it: Enlist the help of your social media influencers and return attendees to share these peer perspectives. Because who better to sell a prospect on a ticket to your event than someone already in their social circle. 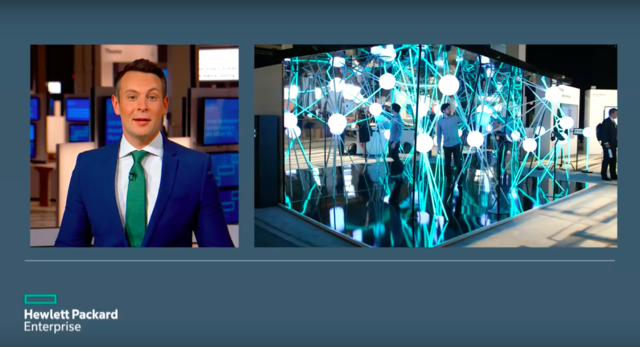 What it is: A shorter version of the highlights reel, this 30-second piece is designed to be dynamic—it’s sole purpose is to get people excited about the show. Quick facts and stats about how many people come to the event or how many presentations they will see can make the message even more compelling. How to use it: The teaser’s short format makes it ideal for social media sharing and paid ad buys across social and digital channels. What it is: Yes, it’s the same idea as the pre-event highlights reel, but this shorter-format compilation of the best footage and sound bites from the show gets edited on-site and sent out before attendees even leave for the airport. How to use it: Interest in next year’s show drops off the minute attendees get in the cab. This leaves them with a “postcard” from the event they will remember. What it is: Repackaged highlights from the previous event that acknowledges attendees probably can’t see everything they wanted to see. How to use it: Use your attendee data to customize the outreach, so you’re sending a recap of a session you know that attendee didn’t get to see. They’ll appreciate the personalized touch. What it is: A short snippet of an interview or a general session where the speaker talks about something that has recently become news. For example, if that hot new product released at your show is making news three months later, a well-timed release of that video content can place your event in the conversation, too. How to use it: Diligently track your show’s speakers and captured content (via Google news or using a social media audit) to see what bubbles up. Then pounce. What it is: Repackaging interviews as a series gives you the ability to repurpose longer pieces into smaller ones, giving the content a longer lifespan. How to use it: Put a little promotional muscle behind your new “series” to build buzz for the content, and then promote each individual episode around the topic discussed. What it is: Content you shot at the show but didn’t share or purposely set aside for later use can be used as “exclusive” footage to intrigue special prospects or audiences. It can be especially helpful for conveying the value of the virtual experience. How to use it: Use your CRM data to pinpoint attendees or prospects with never-before-seen or behind-the-scenes footage from the event. Feeling like an insider generates brand loyalty. You are now armed and ready with a content strategy for your b-to-b event. "Five Ways to Amplify Content From B-to-B Events." Or give us a ring for more ideas and insights on how to build killer content strategies that liven up your videos and boost views. 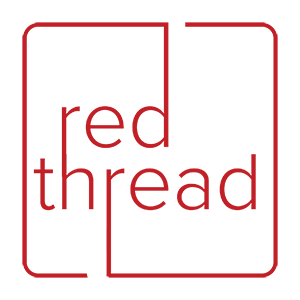 Red Thread is an agency for modern brands and organizations that leverages its background in commerce, media and broadcasting. 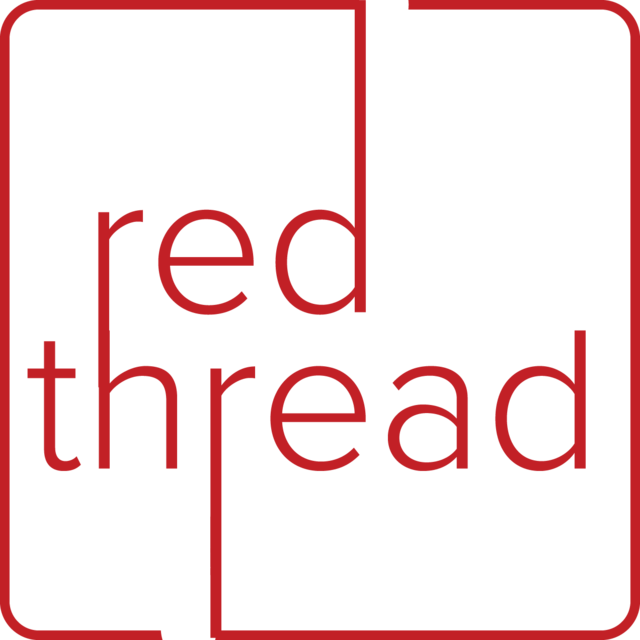 The Red Thread team is a fun mix of multidisciplinary, seasoned professionals that includes producers, writers, strategists, designers and editors. We create video content strategies designed to move modern audiences.